What is Spiral and Vortex code? 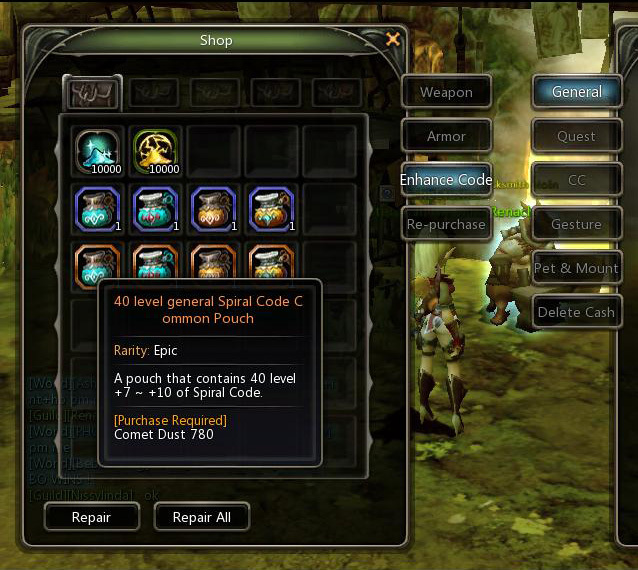 Spiral or vortex code are used to enhance item without fail. Spiral or vortex code only can be purchased by exchanging comet dust and sun spark. These items are sold in Blacksmith. Spiral code has a prerequisite of 1 level lower than the upgrade level of the code. 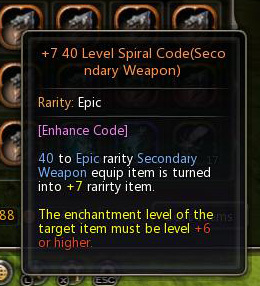 That means, for example: to be able to use a +7 40 Epic Grade Spiral Code (Secondary Weapon), you need a +6 level 40 main weapon. Vortex codes doesn't need this prerequisite. it can be used to enhance for example from +0 to +7 directly.